49 Saturday April 17th 1875. I finished my tidy this morning and began another one. I then cut out my calico dress and got the skirt nearly done. John Anderson came this morning to stay. Late in the afternoon I walked down town. I stopped in town long enough to get some thread and then went on down to Etts. I stayed there all night had a real pleasant visit. I had a letter from Charlie this morning. And one from Mother and Hatt at night. Weather really cold. Sunday April 18th 1875. I did not go to church this morning. But after I had helped Ettie some with her work I finished a book I was reading. Then called on Mrs Beecher and found her real smart. 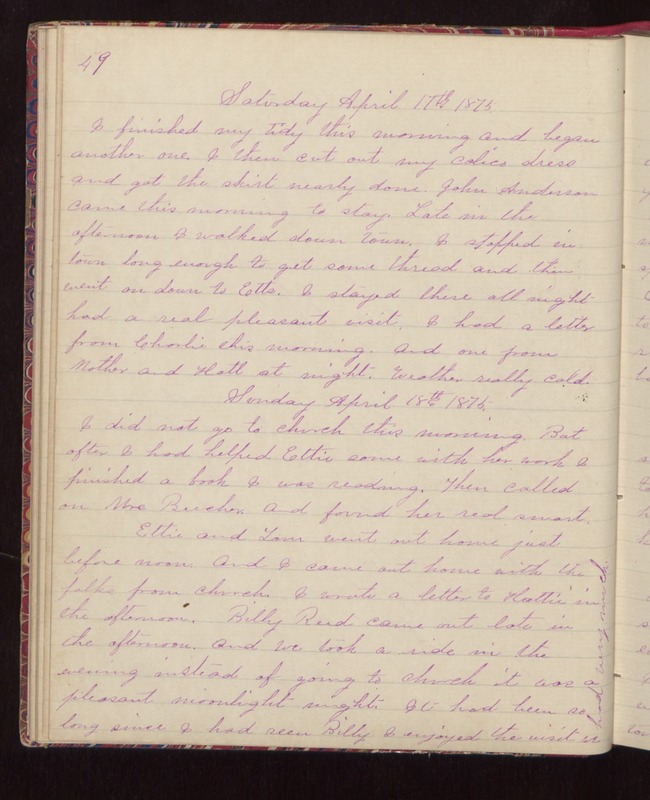 Ettie and Tom went out home just before noon. And I came out home with the folks from church. I wrote a letter to Hattie in the afternoon. Billy Reed came out late in the afternoon. And we took a ride in the evening instead of going to church it was a pleasant moonlight night. It had been so long since I had seen Billy I enjoyed the visit we had very much.